4What about if they do something that causes you to lose respect? 3. compromise and negotiate with your partner respectfully. While this sounds very simple the stresses and strains of modern day life can easily lead for respect to go. We probably all at some point have been guilty of taking our stresses out on our partner. But if this has become a constant way you relate, then you need to take action quickly to restore it. As I mentioned a lack of respect can lead to divorce. A couple that joined my online program recently were suffering from a lack of respect in their marriage. Keith felt his wife didn’t respect the hard work he was doing to provide for the family. She had shared this several times with Keith at home and he became furious saying his trips are not a holiday but hard work, long hours and lots of pressure. This lack of respect for each others’ roles led to a lack of respect in the way they communicated. They spoke down to each other using sarcasm or criticism rather than be kind at first. When they started the online program they were barely communicating. Slowly the relationship was shutting down. The chances are you agreed on the roles you were going to have in the marriage and home. The biggest way to show respect is to support and appreciate each other’s efforts. Compliment and thank your partner. We all like to be praised for the efforts and gifts we bring to the relationship, even if it is our role. This restores respect because being noticed and valued is important. Another way to show respect is to be there for each other if one of you is having a difficult or tough time. Where you listen without trying to fix the problem. You act respectfully when you show support for them during these stressful times. For example; you could offer her/him a “sleep in” on the weekend, a power nap or message if they are tired. Or encourage them to take some time out for themselves and do something they love. Disagreements are normal and healthy in a marriage. Vicious personal attacks at your spouse’s character or personality are not! You can disagree without belittling or hurting someone. This is the difference between standing up for yourself and being defensive and attacking. Everyone has a right to their own feelings and viewpoint and all feelings are valid. It is disrespectful to say to someone “you shouldn’t feel that way” “you’re too sensitive” “stop crying” or your “over-reacting.” This doesn’t help you remain close. This is critical for a supportive close relationship. The first step in respecting your partner’s opinion is to ask for it. Decisions that affect you will often affect each other. As Steven Covey said “The key to commitment is involvement” I heard that when I was 20 and have been using it ever since for all personal and business relationships, sharing my thoughts and asking for input from others. When you involve your partner you are demonstrating respect and honoring their value. Nicola he drives me mad asking me what to feed the baby or where to put the nappies, he should know. What if he didn’t ask and did it wrong I said. He does get everything wrong all the time. So do you tell him that,” I said? Oh yes but he never listens or learns. Reem’s constant criticism had led her husband to not want to take decisions for fear of being moaned at. Then Reem became annoyed that he was asking her opinion on everything. I suggested to Reem that if she wants this to change she needs to empower her husband and let him decide what he thinks is best. So she agreed to try the sayings “whatever you think” or “it’s your call” and not to moan if she didn’t like the choice he made, as she, after all, encouraged him to take the lead. This simple statement shift made a HUGE difference in their marriage. He felt respected and she felt less burdened. Make your decisions together and continue to dialogue until you reach a joint compromise or agreement to disagree and move forward. What about if they do something that causes you to lose respect? If there is lost respect due to infidelity: financial, emotional, cyber or physical or due to an act of violence then respect MUST be rebuilt through consistent acts of kindness over a period of time. Supporting and maintaining respect during the course of a relationship takes effort. We are all human, and if someone begins to treat us negatively, inconsiderately, and disrespectfully, we often tend to respond in kind. This can set off a vicious cycle where the mutual disrespect can feed on itself. Similarly, an inability to resolve or manage conflicts or differences can lead to anger and frustration, which if expressed in negative and blaming ways can start the same cycle of negative interactions and result in the loss of respect. 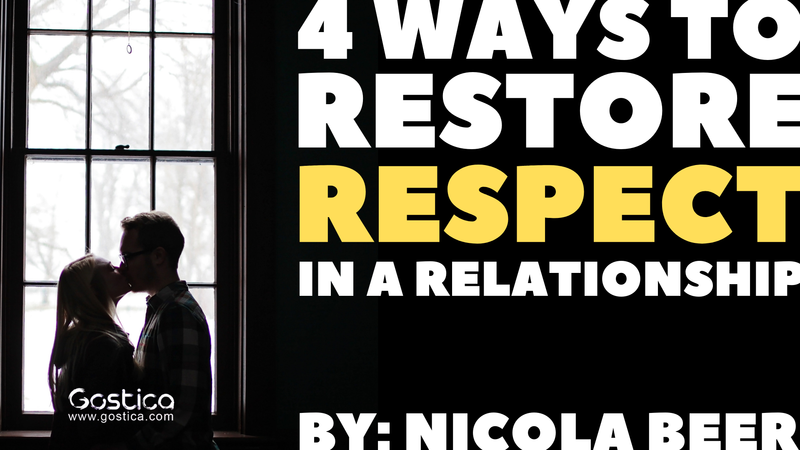 To support couples re-establish respect I share that you can never really “work on the relationship” you can only ever work on yourself.” It is disrespectful to police your partner, so I work individually with men and women to re-establish respect by treating their spouse differently and freeing themselves and the relationship of negativity. Most people believe in Karma but they tend to forget this within their close relationships. Start treating your spouse how you would like to be treated is the quickest way for respect to come back. This was written by Nicola Beer for The Minds Journal. Nicola Beer – A world-renowned expert in relationship psychology and transformation and popular host of two podcast shows. I have been fortunate over the past ten years to help thousands of men and women across the globe to live love filled and vibrant lives through healing relationships and childhood trauma, as well as their relationship to food.